In the late summer of 1876, nearly two-thousand Plains Cree men, women, and children gathered on the flat, rolling plains and the banks near the river they called ka-kisiskaciwan. It was a familiar place for the Cree. For many years they had camped there when trading bison hides and pemmican with the newcomers from the Hudson’s Bay Company who had built a trading post about two miles east. Times had changed, however. The bison herds were disappearing, the people were growing hungry, and more and more newcomers were settling on land that the Cree had camped and hunted on for countless generations. The way of life that the Cree had always known was changing, and the Cree had come, led by their Chiefs, to try and make peace with the changes. They would share some of their land with the newcomers, as long as they would be left in peace to try and adapt to their new way of life. With the bison almost gone, the Cree would have to learn different ways of securing food. They would need some assistance and supplies from the leaders of the newcomers, but this was a fair exchange for giving the newcomers permission to settle on Cree land. However, the leaders of the newcomers, delegates of the Canadian government representing the British Crown, had a different agenda. For them, securing the land upon which the Cree and other First Nations people lived — a vast tract of land covering what is now central Alberta and Saskatchewan — was of utmost priority. There was nation to build, and a railway needed to unite it. The dream of a British Dominion in North America was yet to be realized, and if it was to be realized, land was needed for its development and settlement. To secure the land, it was necessary to convince the First Peoples to part with it. The most effective way of doing this was to make treaties with the First Peoples. The treaties were written documents that stated that the First Nations who signed it had agreed to “cede, yield, and surrender” their lands and any future rights to those lands, to the British Crown. In exchange, the government of Canada was obligated to provide certain concessions, such as annual treaty payments, farming supplies, and small land reserves for the First Nations people to live on. By 1876, many treaties had already been negotiated with First Nations peoples further to the east, including the first five of the so-called numbered treaties that helped the government in its bid to seize land throughout Rupert’s Land and the Northwest Territories. This treaty with the Plains Cree, and other peoples of the region like the Nakoda, Saulteaux, and Chipewyan, was the sixth such treaty to be signed – Treaty 6. 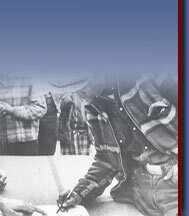 This website presents a brief history of the making of Treaty 6; from the negotiations for the main treaty in 1876, to the adhesions to the treaty that were negotiated right up until 1956. The site explores the Traditional Lives of First Nations people; the histories and cultural heritage of those who lived on the plains for thousands of years. The contemporary lives of the First Nations are also explored, retracing such issues as land claims, life on reserves, and the many efforts underway to promote cultural healing among those whose lives were changed forever by Treaty 6. Sources: Christensen, Deanna. Ahtahkakoop: An Epic Account of a Plains Cree Head Chief, His People, and Their Struggle for Survival 1816-1896. Shell Lake, Ahtahkakoop Publishing, 2000.